Scientific studies utilize statistics to draw conclusion. Statics is an importance element of a research study. Scientific studies assume that the population of the subject under study is too large to an extent that scientist will not study each individual of the population. Therefore, statistics is used to design, interpret and draw conclusion on the results of the study. There are several statistical tests categorized into parametric and nonparametric tests. The choice of any of the test depends on researcher's choice. Usually, a research may require several tests but scientist limit their choice of statistical methods because of specificity in research. Specific research seeks to investigate unknown facts and these facts or assumptions are used to make choices or create policies. This paper aims at analysis fictitious data using SPSS software and several statistical tests. The focus of the paper will be creating and analyzing fictitious data about differences in organizational performance when a woman or a man is a senior executive. Since women and men are perceived to perform differently incorporate management, a research has been carried out to prove indicated that modern women can perform better than men. This research was conducted at the end of 2013. 40 companies were chosen as sample representatives of companies in the U.S. that have women as managers and chief executive officers. Companies participating in this research were chosen randomly from different industries. Data were collected, which captured management posts and companies' profit margin of one year. The research utilized SPSS software to analyze the data and measure the relationship between women managers and profit margins of the companies selected for the study. The assumption for the research was based on the statement that women were expected to perform better than men in realizing profitability for the company. H0: men and women senior management styles do not differ significantly in regard to the firms' profit margin results. Gender is one of the variables selected for this research. In this study women and men are managers of business firms. The two genders are perceived to have different management styles and different profitability. Gender in this research contributes to comparison of their results, their management styles, and profitability of companies. Although there are several leadership positions in the company, this research selected senior management and chief executive positions. Women and men are supposed to take any position according to the data collected, but differences are expected in their results. Profit margin is the main result of being a woman and a CEO, or being a man and CEO of the company. This variable has four categories, which are classified according to the profit margin gain in millions of dollars. The four categories are created from a range of 0-20 dollars. Managers participating in the study are important. The age is ranged from 30-60 and categorized into 4 categories to include: 1(30-39), 2(40-49), 3(50-59), and 4(60-69). There was no likely senior manager or CEO below 30 and above 60 years. In this research the median age of managers for both genders was in the 40-49 years category. The research sample and companies revealed that the average age of companies' managers and chief executive officers was between 40-49 years. The standard deviation for this statistic was 0.987. This means that 98.7% profit margin deviates from the main profit margins for 40 companies headed by both male and female managers and CEOs. Figure 1. 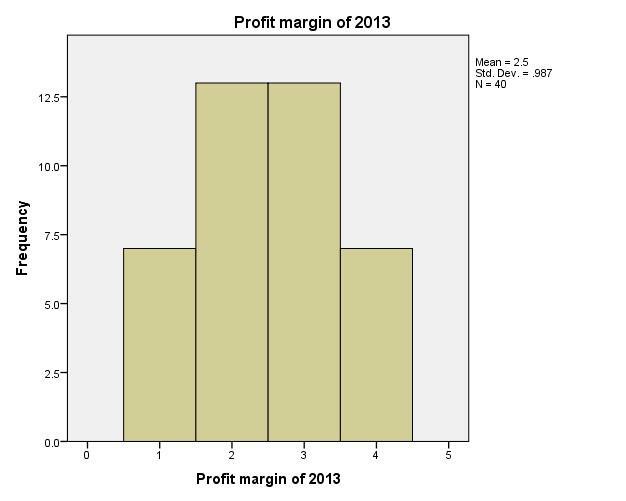 Profit margin of 2013. H1: men and women management styles differ significantly in regard to the firms' profit margin results. This is a two tailed test and the statistical test result is .236. In other words, the actual p-value is 0.236. Since the actual p-value 0.236 > 0.025, we fail to reject the null hypothesis and conclude that men and women management levels do not differ significantly in regard to the firms' profit margin results. The One Way Anova is a method of comparing means. In this research the test was applied to find out whether gender senior management levels have different results in the companies' profit margins. Gender was the depended variable, while profit margin was the independent variable. The nature of the variables allowed the use of two tailed test, which compared means of gender and the results of the companies' profit margins. Gender stereotypes and gender discrimination have a long history. For a long time, men have been favored over women. Women have been viewed as inferior and gender that cannot perform competently. In the modern society, women receive equal rights and are treated accordingly. Democratic countries are leading in giving women equal opportunities perhaps because of political reforms. In these countries, women are no more exceptions in top management positions and are viewed as men's equals. Nevertheless, even though women are receiving equal rights with men, few women still hold top executive positions in companies worldwide. In business, management and executive posts are different positions. In the past decade, women held a large percentage (60%) in management positions in comparison with executive positions (4.8%). The percentage of executive positions for women is still small, indicating that the women still are stereotyped in holding senior positions in business organization. This trend occurs in both publicly and privately held businesses. In 2007 the percentage of women in senior management was 24%, which was an improvement as compared to 19% in 2004. Researches on the gender differences in senior management positions reveal that women are holding senior management positions, but executive positions do not seem to be fully obtained by this gender. The explanation for fewer women in senior executive positions is that most companies are run by owners male who assume the executive board. According to Grant Thornton International, among global countries Philippines is exemplified as the country that favor women's equality, as it has the highest percentage of women holding senior positions in business firms worldwide. The Philippines Department of Labor and Employment reports a steady increase of women in both management and executive positions. According to DOLE figures, the ratio in these senior management positions in 2002 was 1.86:1.4 million females to males respectively. Philippines gender researchers and advocates of women in senior positions demonstrate that the country has broken the proverbial labor joke of 'glass ceiling' in both private and government sectors. In this country, there has not been an all men management policy for the past 25 years; it means that women dominating in the management positions did not start yesterday, but several years ago. The best result for women in management teams has been a ration of five females to two males, but this data is specific only to Philippines. Although the explanation for women holding sparingly fewer executive posts is preferably explained by the fact that male firm owners take up these positions and their sons inherit them later, as a result, negative stereotyping never ceases to exist. Women who have held these positions can testify that they go through gender bias and discrimination within and outside organizations. It is shocking to find out that gender stereotyping still exists in the 21st century and might move on the 22nd century. However, even though women are still perceived as less capable than men in executive positions, the Philippines has revealed that it is possible to dramatically change these believes. Therefore, if the trends are kept constant, many countries are going to have more females than males in senior positions in the future. As for gender stereotyping, the widely held belief may be abandoned as extensive researches has tried to indicate that there are no differences between both genders in senior management positions. Women and men perform equally in senior positions if all factors are held constant. However, researchers also express their concerns about the fact that the society still downplays the efforts women make to have senior positions, continuing stereotyping this phenomenon. When analyzing gender stereotyping in senior management offices, some researchers have indicated that there are tendencies of both males and female respondents to describe females as less effective for the positions. These respondents cited that they perceived women as lacking self-confidence and having unstable emotions in the workplace in comparison with their male counterparts. However, what these respondents failed to admit was that both men and women prepared beforehand for the positions. With such a preparation backed up with experience, women can perform equally in senior positions and their performance is not different from that of men. However, the gender stereotype mindset is not changing in some individuals in the society and even the elites still think that women are inferior to men in the workplace. The research is compassionate and does not necessarily blame those who still have negative stereotypes about women. Researchers indicate that these negative assumptions about women and their ineffectiveness as senior managers in private and public organizations are created because women are viewed as individuals who place motherhood ahead of everything else. First, mothers lose interest in senior positions because of their commitments to families at the expense of senior work. Second, researchers indicate that those still having elements of stereotypes believe that women provide supplement to the home income and, therefore, take little interest for enormous and competitive success required in business. Third, researches underline that those believing that women cannot perform in senior positions reveal that women do not take up negative criticism. If they do, they take it personally rather than professionally; hence, affecting the quality of their tasks in the workplace. Fourth, gender stereotypes argue that women as top managers are too emotional and do not practice aggressiveness in pursuing the interests of the organization at the expense of remorse. Researchers indicate that these assumptions may be true but women have also changed and have learned that the business world is different from their emotional and biological images. Women understand that the business world is analytical and success can only be found through certain behaviors and not others. Therefore, the increase of women managers and women in senior positions can help explain that women are changing emotionally and are creating strength towards satisfying business expectations, convincing most respondents who do not regard them as able to succeed . Even though assumptions about women being unable to manage large enterprises may seem valid, this validity results from the fact that women themselves do not dismiss criticism and accept the mindset that they are unable to pursue and compete managerial careers. For example, although the assumptions of family priority are valid and women tend to focus on their children, there are exceptions. For example, older working women who have adult children, married without children, or women with no family and can take their time to concentrate on senior positions. Therefore, the family assumption may not apply to this type of women. However, numerous research evidences have indicated clearly that women in senior positions in the United States are divorced, married with no children, or have never been married. This evidence confirms that women with families will rarely pursue these demanding positions in organizations. In addition to the assumptions associating motherhood with lack of pursuing senior positions in organizations, women who are well qualified and professional may still voluntarily not want to take up senior positions in favor of their families, until they have minor problems with their families. However, this phenomenon is disputed, especially where the corporate world, insatiable for competition, is concerned; women would more often want to pursue greater posts without having a concern about the family. Many scholars have argued that negative gender stereotype is a form of discrimination. Sometimes those committing this act do not realize that they practice discrimination. From the perspective of discrimination, people discriminate women indirectly, perhaps because of the mindset that women cannot and have never outperformed men. Sociology scholars believe that this is a simple mindedness about women is a joke. Unbelievably, some male seniors even in the workplace do not realize that they practice gender discrimination at the highest level because they seem to assign tough tasks to male employees rather than to female ones, claiming that women might not meet their expectation because of the nature of the job. Obliviously, this is discrimination, albeit those who discriminate do not realize it. Cases of women being denied promotions despite their excellent performances are common. Today, companies are searching for young talents to train and most managers probably select males for long term positions because young women are perceived to think about having children at the slightest opportunity. This is another form of subtle discrimination, which is assumed to propel women incapability to assume senior posts. It is also important to note that senior managerial positions are not easily offered because of the fact that those who will be hired must have exceptionally diverse experience and expertise. Those with these experiences are sometimes known to have tribal knowledge. Tribal knowledge is described as the aspect of few experienced employees having company's intelligence information. These employees are always older and have stayed in the organization for a long time. Employees with tribal knowledge always seem to control and influence the organization and most of them end up in executive posts and senior management positions. Therefore, with reference to gender, women do not have this tribal knowledge because they do not stay in the organization long enough and cannot not withstand the challenges of growing in complex business grounds, gain and keep tribal knowledge so to speak. It is not compelling when men argue that their biology is different from women's. These men always have old thinking and mindsets; they claim that they will concentrate little if they are in a group of women. Some scholars who have found evidence in these mindsets indicate that sexism and sexual discrimination is not new in the workplace. They indicate that sexists did not only live in the past, but they still live today. Unless men stop thinking they cannot make serious decisions when they are in company of female counterparts, they fuel sexism and gender discrimination. Even though there are significant evidences of women loosing senior management positions in corporate world because of gender discrimination, the reverse is true when women own businesses. Except for inheritance, women who own business take up the roles and positions of executives. These differences are better revealed in the U.S. alone. In this country, approximately 50% of women have taken roles as senior executives in privately owned companies. According to the Center of Women Business Research in Washington, D.C., the 50% women who take up roles as women executives in U.S. businesses do so in approximately 47.7% of 11 million private companies. In other words, these 47.7% of enterprises can be described as women-owned firms. These firms are significant to the economy because they generate approximately $2.5 trillion sales and they offer direct jobs to approximately 19 million U.S. citizens. Therefore, women are capable of performing significantly in the corporate world, especially if given opportunity in modern world. An explanation for the female management style, described as superior to male management, includes the following differences: first, the biology of upbringing is thought to make women more flexible than men. Psychologists have indicated that men have larger brain but women have more nerve cells than men. These physiological differences in brain components explain why women have more emotions than men. However, their flexibility in management and leadership style make employees feel that they are being led rather than being managed. It is undisputed fact that women tend to process tasks faster than men because of the large corpus callusum, nerve fibers that connect the right and left hemispheres of the brain. The brain structure allows women excel in tackling numerous tasks at once; hence, their higher flexibility. Second, the research indicates that women are excellent at exhibiting the following leadership strengths as compared to men: women's leadership is always effective and employees feel loyal to women leaders; women are likely to encourage openness and distribute issues to all employees; women leaders are more accessible than men leaders; women leaders are more likely to offer their assistance than men; women are more tolerant towards differences in the workplace and accommodate a diverse culture as compared to men who only accommodate norms and cultures they are used to; women's interpersonal skills are better than those of men. Third, soft skills of women in communication are thought to win employees and customers; hence, they grow businesses faster than men do. Women communicate common goals to employees, appreciate both customers and employees more often and tend to be loyal to all stakeholders. Today's workplace is operated with technology and socializing is minimal. Women tend to take breaks from technology more often than men and that is why they use such an advantage in the workplace to talk to employees and customers personally. The physical presence has given them advantage over men in business. Fourth, ever wondered why women are not given senior positions to manage? Men believe that women have more passion and compassion to others than to themselves. Therefore, they would rather save the situation outside than inside. Naturally, women are willing to compromise and share people's opinions when they are expected to be stiff. Although sharing other's opinions seems like an act that will fail business, those who give these opinions do not intend to worsen the situation for women. The case could be different if employees or others give opinions for a male leader. Men, whether they have employee/leader relationship or employee/manager tend to compete. This case is different for an employee/woman leader. Researchers through scientific studies have admitted that women admirably taking up seniors roles in the corporate world are welcome, social researchers have indicated that women in these positions have different norms of management. The male ego in the workplace is demonstrated as command-and-control behavior. Women in the same workplace and in the same position demonstrate a consensus approach, which is different from that of men. For women, every member seems to have equal opportunity to control. In this case, there are different personal traits exhibited in the workplace when male and female are leaders. This phenomenon has nowadays resulted to situations of female and male management styles. Researchers have tried to compare management styles of females and males and have indicated that their effective results depend entirely on the type of business being carried out. In these comparative researches, female leadership styles have been described as slightly aggressive; a description associated with better management style in comparison with men.